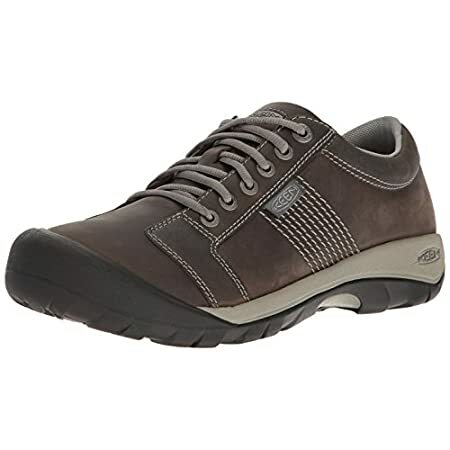 KEEN Men’s Austin shoe has been based on the unique hybrid form technology to provide the users the best kind of comfort and style they need on the go. Due to its unique blended features from the native sandal sole structure and contemporary leather shoe style, this shoe offers comfort, style, protection and easy walk at the same time. No matter how much you walk and where you need to go, you can count on this pair of the shoe as it can be worn at times when you are in a business class gathering or need to go out for a walk to the next door, you will be enjoying a classy look all the time. The materials which have been used in this shoe include leather and synthetic rubber and also textile lining and absorbent foam cushioning. All the materials used in the shoe are of high quality and ensure long lasting support and easy maintenance. ​The upper of the shoe is made of leather which gives the shoe a classic leather shoe look with supportive stitching on the front and lateral sides that also adds up to a stylish look in the shoe. The upper leather is water resistant and will offer complete protection against any kind of moisture or water itself and keeps the shoe safe from getting damaged. The shoe comes in a contemporary style offering rugged yet classic looks. It offers casual as well formal look to make sure you won’t hesitate to wear it anyway. It suits best with any kind of outfits like a party wear or casual wear. The inner lining is made up of absorbent fabric that allows quick absorbency of the sweat that makes the wearer feel dry and comfortable and allows the foot to stay easy and will not cause any slipping within the shoe itself. The toe, the midsole and the heel area of the shoe are equipped with enough padding and support to maintain the actual posture of the foot and keep the pressure to the least to lower the level of fatigue and stress. The Metatomical footbed is an added advantage introduced by KEEN for extra support and comfort. The shoe fits easily to your true size and may not need to find a larger of smaller size as it has been made perfectly by keeping in mind all the important aspects of shoe structure and foot sizing. With all round fabric lining and cushioning on the sole, the shoe provides a comfortable fit for an easy walk. The KEEN technology also features oversized toe protection to cover the front part of the toe and provides enough room to keep the toe safe and easy during the walk. Though you may consider buying it if you have a broader toe and need more room for your toe to stay safe and easy. Along with all the features and benefits, the most important thing is the easy usage. You can put it on and off without struggling with any issues. You don’t have to adjust it a lot as it comes in perfect sizing and structure. The shoe is very easy to use and provides extra comfort to keep you easy and feel luxurious while walking. Due to its contemporary design and looks, the shoe can be worn in any kind of party or meetings or for walk making it a multipurpose accessory for style-conscious people. ​Sleek and lightweight and also it is durable enough to make you feel confident all the way you wear it. It has an anti-slip sole to make sure you can walk on any surface you want to. ​Waterproof upper leather to keep your foot safe from getting wet. ​The shoe can be cleaned easily and may not need lots of maintenance due to the fact the upper surface is water resistant and will not let any liquid or stain stay on it for long. Though there are numerous benefits, its stitching may come out if they are used aggressively on a daily basis. So, it may not stay in shape if you use it a lot. The shoe has been trusted as a perfect walking, casual-formal companion and has averaged 4.4 out the total of 5 stars quality rating. So, in case you are in need of a comfortable yet stylish looking shoe, this one comes with all the features you need. users have described the shoe as comfortable and easy and a stylish option for anyone who has to go out on various occasions and may need a common solution to save some time. All in all the shoe has introduced a perfect combination of sandal features and leather shoe looks. Due to the intermingled looks and features you can enjoy a level of comfort and easy walk that is just like you feel in your sandals, whereas you can also enjoy the comfortable padding and rugged outsole for a safe walk on any kind of surface. Along with these benefits, the leather upper with water resistant surface makes the shoe perfectly suitable for you to go out anywhere without worrying about its looks as it will maintain itself as a classic leather shoe no matter how you have been wearing it so far.